Join us for another exciting round of Mega Fortune Wheel! Click here to play! You'll get the chance to spin the Mega Wheel to bring in exciting prizes and maybe, just maybe, a mega fortune! As you spin these reels, you'll want to aim for the diamonds. These sparkling stones only appear on selected reels but they will substitute for most other symbols to help you create more winning combinations. Also aim for the jet planes, as these will bring in big wins. Two to five of them across an active pay line will get up to 5000 times your line bet. There's also the little red sports car to help you earn your mega fortune. This symbol will get you up to 1000 times your line bet. Also watch out for the $, A, K, Q, J, 10, 9 and 8 symbols because they'll bring in a pretty penny as well. You wouldn't be able to play Mega Fortune Wheel without the Mega Wheel. This prize wheel is a scatter and will bring in up to 100 times your total bet if you spin two to five of them anywhere on the board. Three or more will trigger a bonus feature in which you can play for plenty of cash and fantastic prizes! So, join us in another round of the fantastic Mega Fortune Wheel and you'll win, win, win! The Mega Fortune Wheel acts as a scatter. Spin two to five of them anywhere on the board and you could win 1. 5. 20. 100 times your total bet. Spin three or more anywhere on the board and you will trigger a bonus feature. The sparkeling diamond is a substitute. It will replace all other symbols, except scatters, to help you create more wins. It only appears on reels 2, 3 and 4. The scatter Mega Fortune Wheel will trigger a bonus feature if you spin three or more anywhere on the board. 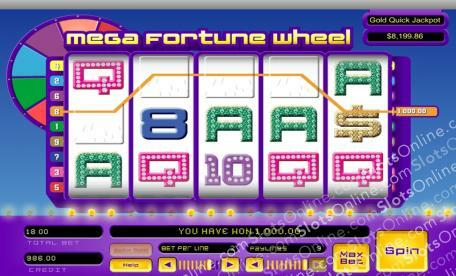 During this feature you will get the chance to spin the Mega Fortune Wheel. Whatever number it stops on will be your bonus prize.